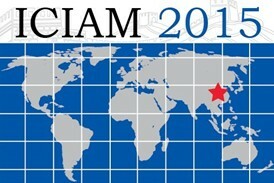 The International Council for Industrial and Applied Mathematics has selected ÉVA TARDOS, Jacob Gould Schurman Professor of Computer Science, Cornell University, to deliver the Olga Taussky-Todd Lecture for the upcoming ICIAM 2015. Professor Tardos was chosen for her numerous and deep contributions to the fields of combinatorial optimization, discrete algorithms and algorithmic game theory, and her ability to convey the basic ideas and inspire others to pursue them.Read more.. The International Council for Industrial and Applied Mathematics (ICIAM) has announced the winners of the ﬁve ICIAM prizes for 2015.Read more..